Dogtown Books is a locally owned, independent, used bookstore serving Gloucester since 1997. Our Mission is to be the best destination for Gloucester’s local and visiting readers, writers and creatives, and to connect people with the books that they will love. In April, all Gardening & Cookbooks are 20% off! 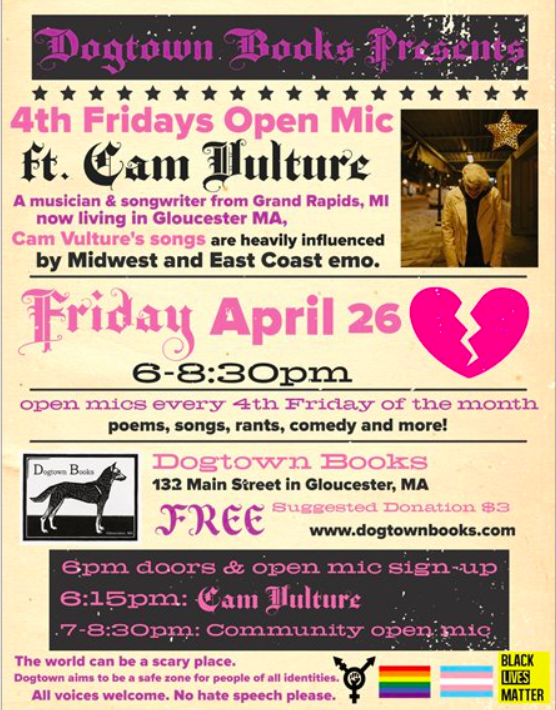 4th Fridays Open Mic: April 26th, 6-8:30pm, ft. Cam Vulture. Come to listen, share a performance, make new friends…or sit quietly in the back with your hood up. Fox Welsh joins the Dogtown Books 4th Friday Open Mic series on March 22 for an evening of sharing stories and discussing the creative process. Before the community open mic, Fox will give a short reading from their current work in progress, Songbird, a YA novel about queerness, mental health, and living outside the boxes we are expected to fit into. They’ll also give a talk about the process of writing a novel, especially when built on personal experience, and the ways that they integrate creativity into their everyday life. If you’ve ever had a question about the novel writing process, are struggling to get your creativity flowing, or have something you’d like to share on the mic, stop by and join us! 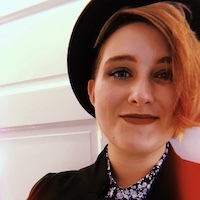 Fox Welsh is a queer, non-binary writer with a passion for storytelling of all kinds and lifting up the voices that aren’t often heard. In undergrad, they studied sound engineering at Berklee College of Music and spent their spare time writing songs and competing in poetry slams. Recently, Fox completed an MA in Writing for Young People at Bath Spa University. When not writing, Fox can be found teaching classes for Grubstreet and Berklee Online, working as a freelance editor and creativity coach, and drinking excessive amounts of tea. Songbird tells the story of Bird, a senior in high school looking to leave behind her depressed-musician-girl-with-dead-dad persona. When her year at a new school starts with her falling flat on her face in the cafeteria, Ben and his friends decide to take her under their wing. But Bird can’t stop feeling pulled toward Corrine, a girl who her new friends seem to hate. As she struggles with her sexuality, her depression, and finding her voice, Bird has to overcome the pressure of what everyone wants from her and figure out what she wants for herself. ALL OF MARCH 2019: 20% off Art & Architecture Books! What: a monthly open mic! poetry slams, music, and more! 2019 Dates: March 22, April 26, May 24, June 28. BOOK RELEASE for Arthur Bloom, M.D. 's In My DNA. He will be doing a reading on Saturday March 2 at 4:30pm at The Cultural Center of Rocky Neck in Gloucester, and Dogtown Books is co-sponsoring! Co-owner and Poet-in-Residence Caroline Harvey will be hosting The Music of the Sonnet on Sunday February 10th from 3:30-7pm in our store at 132 Main Street in Gloucester. Limited to 12 participants and open to any writers of all levels ages 15 and up, the investment for the workshop is $20. You can pay via paypal here, or come in the store and reserve your spot. With Valentine's Day in mind, we'll cover the basics of English sonnet writing and focus on themes of love, self-love, empowerment, and connection. (Cynics are welcome, too!) Write for yourself, as a gift, or just for the joy of it! How: limited to 12 participants; $20 fee. Click here to reserve your spot in advance! All payments are nonrefundable, but you can transfer your spot to someone else. To follow, owners Lucas and Caroline are hosting a Valentine's Day Open Mic on Thursday February 14 from 6-8:30pm. Workshop participants are guaranteed a spot on the reader's list, and all community members are welcome! We’ll have chocolates! Plus, we'll be raffling off a very special poetry book. Attendance is free, donations are accepted, raffle tickets are $2 each, limited to 5 per person. When: Thursday February 14 from 6-8:30pm. Sign ups begin at 5:45pm. How: Just show up to listen, hang out with other book lovers, take yourself or someone else out on a date, and/or share a poem you like (original or a cover)! Keep in mind, poem must be under 4 minutes in length. Monday December 24th, Christmas Eve: we’ll be open from 11am-5pm for your last minute shopping needs! Original Dogtown Bookshop owner Bob Ritchie embraces retirement as the torch is passed to Gloucester residents Lucas Cotterman and Caroline Harvey, who take ownership of the store on November 19, 2018. Gloucester’s legendary destination for used & unusual books has been a favorite for locals and visitors since 1995, and you can count on the new Dogtown Books owners to honor this rich history. It will remain a locally owned and independent used bookstore with a uniquely Gloucester flavor. Building upon this legacy, expect more and new inventory, new book topic sections, literary gifts & goods, open mics, workshops, kid friendly activities, author events, and some new and cozy reading nooks…just in time for winter! Grand Re-Opening Celebration and Sale is scheduled for December 1st from 10am to 6pm. Follow us on Instagram and check out our Etsy Shop! Lucas and Caroline are avid readers, oddity and vintage collectors, and used bookstore junkies. In fact, they first met in a bookstore in Big Sur, CA! The privilege of owning something as special as Dogtown Books is a cherished, lifelong dream for them both. They will ensure Dogtown Books remains Gloucester’s best destination for used books, and will prioritize inclusion, accessibility, creativity, and a feeling that when you come in the door, you’re always welcome. Lucas is a writer and visual artist, and before owning Dogtown Books he toured as a lighting designer for over 15 years with bands such as The Strokes, Interpol, Arcade Fire, and Death Cab for Cutie, just to name a few. Caroline has been a professor at Berklee College of Music for almost a decade, and she continues to tour and lecture worldwide with her original writing and curriculum. Her grandparents owned a home near Niles Beach, sadly taken long ago in a storm, and she is proud to be among four generations of her family to call Gloucester home. Ladybird Johnson is their 6 year old Shar Pei, and while she might not be able to read (yet), she plans on sleeping and quietly snoring in the store. Dogtown Books is still located at 132 Main Street in Gloucester, MA. Our business phone number is 978.281.5599. The Grand Re-Opening Celebration and Sale is scheduled for December 1st from 10am to 6pm.